We provide independent liquid hydrocarbon calibrations with low uncertainties. Calibrations are NVLAP accredited and can be performed on a variety of oils. The facility is composed of two separate loops, which can operate either independently or in series. 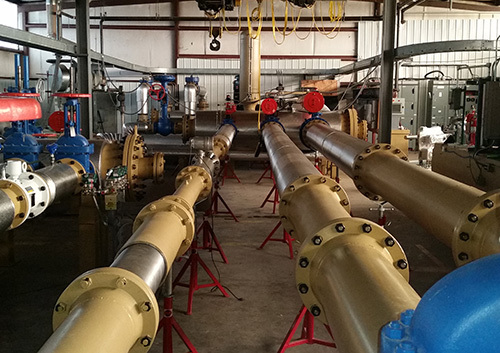 The small loop allows for the calibration of meters from 1” to 6” line utilizing a FMD small volume prover or a combination of the prover and flat bladed turbine meters as master meters, depending on the meters to be calibrated. The medium loop can calibrate over the full range of 6” to 12” line size meters, with the ability to do 16” meters over a limited range. The basic calibration standard is a 20” bi-directional prover, although if the small line is brought into service the FMD small volume prover can also be utilized, giving a valuable conformation of the facility uncertainty due to the two methods being used in series. 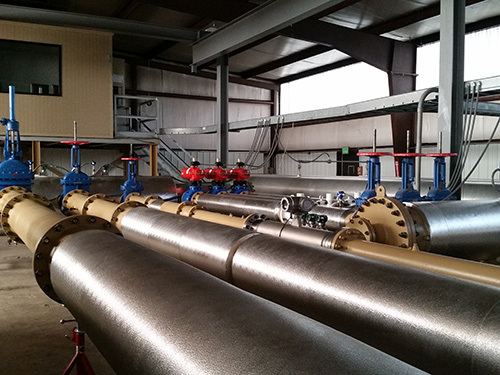 Higher flows are obtained using helical bladed turbine meters. These were chosen because of the improved performance at higher viscosities. The oils used for both loops cover the nominal viscosity range of 2.5 to 200cS, but there is provision for a specific oil to be used if required. A major feature of the facility is the temperature control. Experience has shown that good quality calibrations for meters that exhibit Reynolds number characteristics is best carried out when the fluid temperature is very stable. 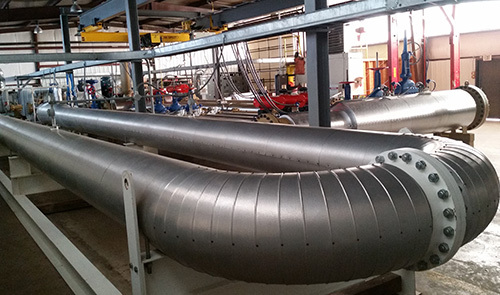 The facility has a heat exchanger to allow control of the temperature to within 0.2 F° throughout calibrations. Steady pressure in the system is achieved using an expansion tank. These features are designed to ensure much better repeatability during calibrations as the Reynolds number and flow variations will be controlled. For information about the new facility from the VSL Dutch Metrology Institute, read CEESI’s pipe prover for new flow facility calibrated by VSL and CCI.